If you haven’t been living under the rock from the past decade then you must be knowing that you can make money from YouTube by making videos of different kind and uploading them on the internet. Well if you didn’t knew then let me tell me its possible to make money from YouTube by just uploading videos to the largest video directory in the whole world. Now if you want to know how then I’ve explained it in the post below and first let me tell you; it is easy to make make from YouTube. In below post I’ll tell you how to get started with an account to make money from YouTube and upload videos and start earning money from the first day itself. Well to answer this question there’s no rocket science to make money from YouTube. All you have to do is upload a fresh and original video (Yes! you need to upload original videos; you can’t post movie trailer videos and earn money from them) recorded from your camera, a screen-cast recorded on computer, cover songs video, how-to videos just about anything you can think of only it has to be original. Know the guidelines (Click the link; its important) to make money from YouTube. Now when you upload an ‘original‘ video; you need to enable monetization on that video and every other video that you upload (Don’t worry I’ll tell you how to do that) which enables YouTube (read that as Google) to place ads over your videos and whenever a viewer clicks on those ads you get paid some money from YouTube. OK I got an idea; Now how to monetize videos? I’ve posted steps required and explained them below from how to start a YouTube account and make money from YouTube. 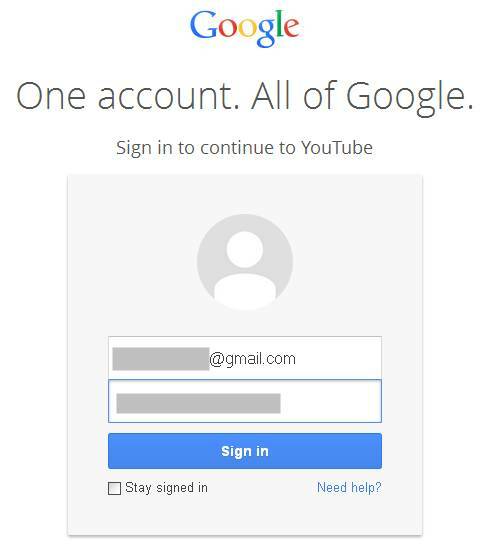 Since Google has made easy to use any of its services with only one account; so even if you have an GMail account you can go to YouTube.com; hit sign in and log into YouTube account dashboard. This is how a new YouTube dashboard looks like; since to start fresh mine this YouTube account also doesn’t has any video. Click on the Upload button at the top of the page next to the search bar to upload a video. 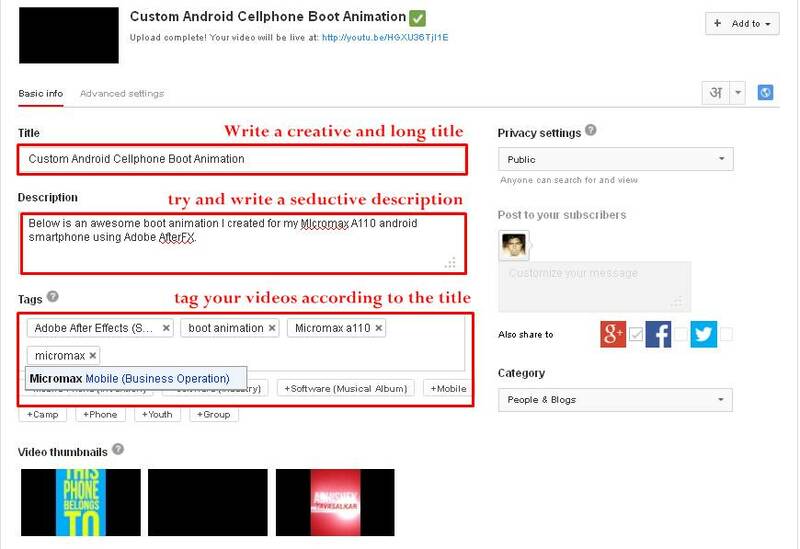 I have created a custom boot animation for Android phone; I’ll be posting video of the boot animation as a sample video. I understand you don’t have a video to upload but for start you can upload any video from phone camera chilling with your friends or playing with your dog too will work; just have a video ready to be uploaded. You can drag video to be uploaded in this interface and the upload process will start immediately. After the video is uploaded fill the text fields according to the video; an example is shown in above picture. Actually as soon as you upload video it becomes live and there’s no save button as the changes you made are saved automatically. You can click on the blue link below the title to see your video live. Now we need to start the monetization process. 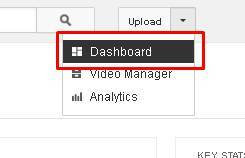 Scroll upwards and just next to the upload button click on the downward arrow and select Dashboard to manage different YouTube settings. Inside Dashboard click on Channel Settings in the left pane; you’ll see Monetization option on the right pane. 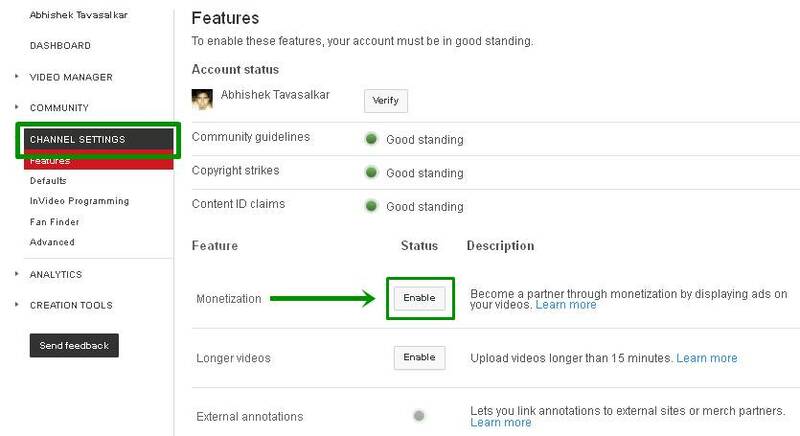 Click on Enable My Account to enable your account for monetization to make make from YouTube account. After you click on Enable My Account a popup will appear with terms and conditions; accept it now you get Monetize My Video option to select the type of ads you’d like to be displayed around your around; select only two of them to make money from youtube and then click on Monetize. Now you’ll notice $ next to your video which shows your video is monetized now. In the next part you’ll know how to link your YouTube account to an adsense account (Important part) to save your earned money in the Google Adsense account. If you liked this post share it on Facebook, Twitter and Google+ and let us know your opinion in the comments section. Be hooked for the next part coming soon. AllTechTrix.com loves to hear from its users. I agree this is a minimalist guide to making money from YouTube. The tutorial is simple and easy to follow. More so, the ideas are factual on making money from YouTube. However, I think you should should take care of the many grammatical errors noticed in the introductory part. Short sentences should be used and the paragraphs spaced. These would help the web reader to scan and digest your content easily. In addition, a post with too many grammatical errors may not not pass the notice of the editorial team of KINGGED.com. It means your post could be deleted. Please take note!